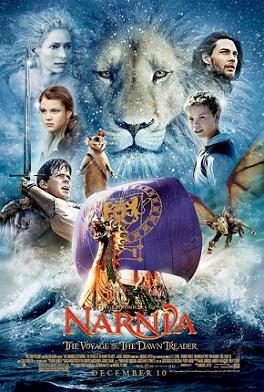 20th Century Fox releases The Chronicles of Narnia: The Voyage of the Dawn Treader nationwide on December 10th, 2010. NYC MOVIE GURU: What kind of changes did you make from the book? MA: The book was a problem because it doesn’t really have a strong narrative structure, so we had to find one. It’s a very casual book [because] there’s no real drive to it. There’s no need in the book to go from one island to another just to get back on the boat and keep moving. That was clearly not going to work in a movie. We examined the material by looking at the next book which is sort of a chiller. We found elements there about people being kidnapped and the green mist and witches and stuff like that which we took from that book and put into The Dawn Treader which I think helped keep the story driving along. NYC MOVIE GURU: How did you find the right balance between entertaining the audience and provoking them emotionally? MA: I think that was my big challenge. One of the main things that interested me about this was that I was doing an epic film that has an emotional center to it. It’s a film that wasn’t bombarded with effects; it has some real, strong emotional context. It was a challenge all the way through to, kind of, balance that. Basically, to have the technology serve the story. NYC MOVIE GURU: Which of the special effects was the most challenging? MA: The most challenging and the most important effect was probably the wave at the end. Water in CGI has made huge advances over the last couple of years. It was such an integral part of the climax of the film. To me, that was the one that I was always holding my breath about in case it was absurd or didn’t make sense. NYC MOVIE GURU: How did you find the right balance between entertaining older and younger audiences? MA: I hope I have, but it’s not talking down to children; it’s treating children as adults. I treated the actors as adults. It doesn’t have a condescending attitude because I hope it, sort of, would interest parents. I wanted something that would engage both adults and children. I hope that adults would, sort of, be intrigued by the complexity of some of it—the complexity of the relationships and the interweaving of the relationships. NYC MOVIE GURU: What kind of method do you have for directing child actors? How have your prior experiences as a filmmaker enhanced your skills directing them? MA: Perhaps the fact that I’ve done these endless documentaries, [The Up Series], starting with children and growing up, I think I’ve learned that you get the best work out of younger people if you treat them just like you would anybody else. I don’t patronize or talk down to them. We rehearsed for a couple of weeks, we talked about it, we rehearsed bits of scenes, we did scuba-diving and all that, but it was really an attempt to engage them. NYC MOVIE GURU: How did you find all of the beautiful locations to shoot in? MA: We spent a lot of time looking. We were a long time in pre-production because with Prince Caspian not doing well, everybody wanted to, sort of, think again about whether there was going to be another one. The volcanic island is in New Zealand, [but] I didn’t take the whole crew to that; we did that with a second unit. The magician’s island we built on a stage. We shot a lot of location in Queensland, Australia, but we used visual effects to extend some locations and make them a little more exotic than they might have been. NYC MOVIE GURU: How did you balance the action/adventure and drama with the right amount of comic relief? MA: It’s always a challenge. One of the difficulties of the film is a tonal thing. I had to keep the film focused. I couldn’t change the tone and suddenly do a cartoon film. It made the humor rather tricky to do, but we worked hard at it because everybody felt that The Chronicles of Narnia: Prince Caspian was a little darker, a little bit without humor and a little bit short on magic. So, one of my agendas, one of my assignments, really, was to work on that. Humor is one of the hardest things to do, especially in the context of a serious story. It also helped that Will Poulter, who played Eustace, is, I think, a gifted comedian. He brings humor and warmth to whatever he does, even if he’s supposed to be playing a nasty character. [In this case], he’s a grumpy character.